The theme for the exhibit is open. The juror for the exhibit is Geraldine Kiefer, Professor of Art History and Art at Shendandoah University, where she has taught since 2003. A practicing artist, published art historian and participant in numerous conferences, Dr. Kiefer has focused her mixed-media work on maps and particularly maps of islands and archipelagoes, including Hawaii and Iceland, her current interest. She researches the context and history of the maps, reproduces them in her own drawing style, draws and writes over them and in sum, creates an exploratory oeuvre that touches on scholarly exploration and artistic inspiration. She has had exhibitions, both juried and invitational, in multiple states. The entry fee for one or two works is $25. Additional works may be submitted for a fee of $10 for each additional work up to a total of four works. The projected prize fund for the exhibit is $350. Additional prizes will be determined by the number of entries. 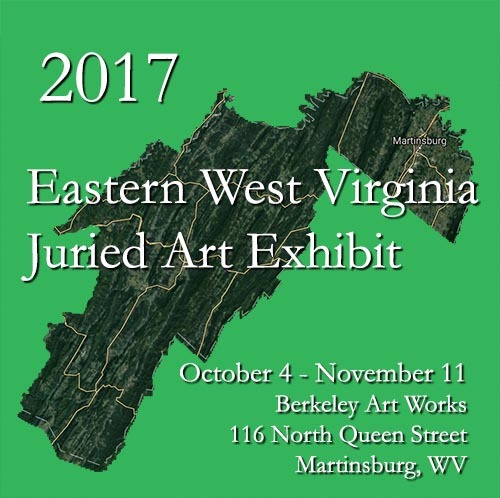 The entry notification announcing the juror’s selections will be sent by email and accepted artists will also listed on our web site, http://www.berkeleyartswv.org on or about September 11, 2017. Entries for the exhibit must be submitted as digital images for jurying. You may submit up to four works to be juried for this exhibit. The image file format should normal (“baseline”) JPEG. Do not save as “progressive” JPEG. The images should be 1200 pixels on the long dimension with the other dimension proportional. Save at 72 PPI/DPI at high quality setting (8 out of 10 or 80% is good.) Set your filename to lastname_title_WxHxD_entrynumber.jpg(example: jones_pretty-girl_11x14x1_no1.jpg). One additional image to show detail for 3-dimensional work is allowed. If accepted, the original works must be ready for hanging and must not exceed 36” in width, including frame. Three-dimensional works, must not exceed 72″ in height and 36” in any direction. Three dimensional work must be free-standing. Paintings and works on paper must be suitably framed. All entries to be hung must be equipped with wire, ready for hanging. No substitution, exchange, modification, or withdrawal of works is permitted after they are accepted for the exhibition. All work must arrive between September 25 and October 1, 2017. Although the Berkeley Arts Council will take reasonable measures to ensure the safety of the entries in the gallery, the BAC is not responsible for loss of or damage to the artwork, and the artist is responsible for his/her own insurance if desired.